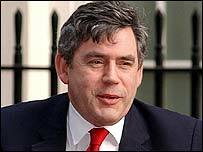 A confident Gordon Brown has allocated extra cash for schools and pensioners - but put the squeeze on Whitehall with 40,000 civil service jobs to be axed. Delivering his eighth Budget, the chancellor froze a range of taxes and claimed the UK was enjoying its longest period of economic growth since the Industrial Revolution. People over 70 will get a one-off £100 to help cope with council tax rises, while primary schools each get £55,000 for school improvements and secondary schools get £180,000. But he admitted that the government would have to borrow £37bn this year - £10bn more than he predicted a year ago - and that borrowing would remain high for some years to come. Conservative leader Michael Howard attacked Mr Brown as the "credit card chancellor" and asked "if everything is going so well, why does he have to borrow so much?" He said that if Labour was elected for a third term, tax rises were "inevitable". Liberal Democrat Treasury spokesman Vincent Cable, in place of an ill Charles Kennedy, said Mr Brown had ducked tough choices on the economy until after the next election. He said the chancellor had done nothing to address "very serious imbalances" in the economy, such as the high levels of consumer debt and the over-inflated housing market. Mr Brown announced that cigarettes will go up by 8p a packet, beer by 1p a pint, wine by 4p a bottle, with duties on cider and sparkling wine frozen. The annual rise in fuel duty will be delayed for nearly six months. He said growth in 2004 would be 3 to 3.5%, which along with the US would be the "fastest" of the G7 countries. He pledged to squeeze out more cash for frontline public services without increasing borrowing through efficiency savings. The Department of Work and Pensions and the Education Department will bear the brunt of the job cuts but all departments will have to cut their administrative costs by at least 5% by 2008. Mr Brown also unveiled plans to relocate 20,000 civil servants from London to the regions, saving an estimated £2bn over 15 years. But the plans prompted anger from the Public and Commercial Services Union (PCS) which branded them "a day of the long knives for public servants across the UK". Mark Serwotka, PCS general secretary, said the union would be seeking an "urgent meeting" with ministers. "For thousands of hard working staff to hear that they are losing their jobs totally out of the blue without consultation is unacceptable," he said. However, Isabella Moore, president of the British Chambers of Commerce, welcomed the reduction in civil service numbers "as this will reduce the burden through the tax system on business". Mr Brown also unveiled proposals to tackle tax avoidance by companies and individuals. And he promised to consult on increasing the supply and affordability of housing after the Barker Review on Wednesday recommended spending £1.5bn on doubling the production of low-cost housing. The chancellor also ruled out a further assessment of the five economic tests for euro entry, but said he would revisit the issue in next year's Budget. He also attacked the EU "stability and growth" pact, saying his fiscal rules were more flexible. He froze corporation and capital gains tax and stamp duty. He also froze inheritance tax, increasing the threshold to £263,000. Film-makers will be paid tax relief directly, set at a new rate of 20%. There will also be more tax relief for smaller breweries and an investigation into the way the tax system treats internet betting exchanges, which have recently been at the centre of race-fixing allegations. But the whisky industry said it was "bitterly disappointed" with Mr Brown's decision to introduce tax stamps in his Budget. The Scotch Whisky Association said the stamps would do little to combat tax evasion and cost the industry millions. "The chancellor wants to cull back-office staff to save money"